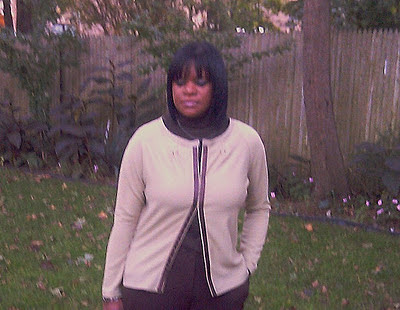 In the last 3+ years I have become a fan of cardigans, they are the perfect addition to my wardrobe. I have purchased many from the Loft, however, I found that every cardigan does not work with my body. At 5'3", long cardigans dwarf me, with a short torso, crop cardigans cut me in half, the boyfriend cardigan hits me at femur length and also doesn't work, and then there are the short & tailored cardigans, which I've come to like the best. The fit suits my body length better wherein the hem line ranges from high hip to mid-hip (21- 23") and the ribbed hem band pulls the cardigan closer to my lower body. 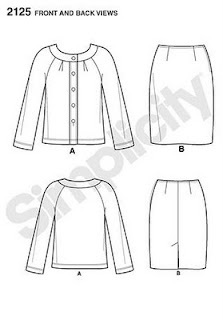 In comes Simplicity 2125, a Its Sew Easy Simplicity pattern which I figured the style line would best fit the rtw cardigans that I have. 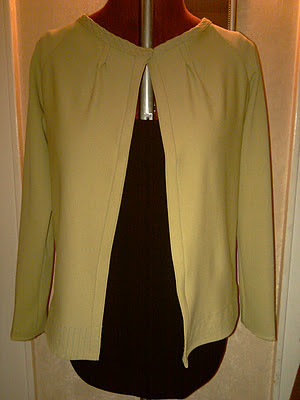 My initial plan was to shorten the length of the cardigan to 20" and then add a 2-1/2" band to mimic the ribbed hem band of my rtw cardigans. 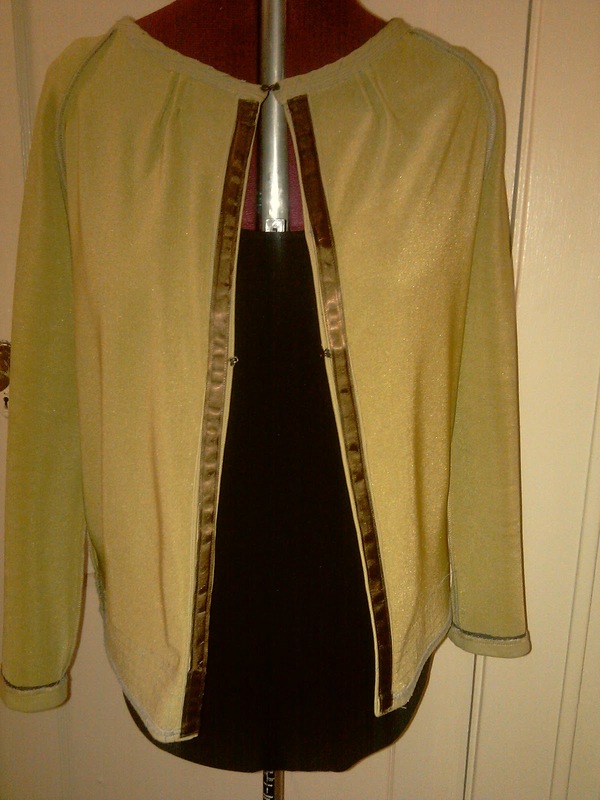 However, I couldn't figure out how to make a faux ribbed hem band so, I just continued on with the jacket keeping it at the natural length of 23". Were the instructions easy to follow: For the most part the instructions were easy until I had to attach the neck band. The neck band consist of 2 pieces, upper & lower bands and the instructions directed with right sides together attach interfaced neck band to garment, which I did, but became befuddled with how to attach the second neck band. Thereafter, I walked away from the garment leaving it hanging on my mannequin for a week!!!. While talking to my dear buddy Andrea and lamenting about the cardigan, she asked me what exactly was I having issues with. She then explained that I needed to attach the second neck band at the edge line of the first one stitch and fold to the inside of the garment neckline. That's why I love having sewing buddies. Now, I was back on track, attached the second neck band, but it was wonky and wouldn't lay flat, which was probably due to my haste in stitching. As Tim Gunn likes to say... make it work, so I removed the second neck band and just folded the first neck band inside of the garment and stitched. To think this is a Its Sew Easy pattern.... obviously not for me. Pattern alterations or any design changes you made: The back was too roomy and pinched out about an 1" from each back sleeve seam merging into the underarm seam. Despite several buttonhole tryouts on scrap fabric and achieving good results, when I did the buttonholes on the garment it totally came out slanted and used ribbon to conceal the ugghness of them and hook & eye for closures. What I've come to realize that the buttonhole band was too thick to smoothly feed across the dogfeed, thereby bunching up halfway through the buttonhole process and also my machine shank is low. Added stitching to the neckline and hemline of jacket . 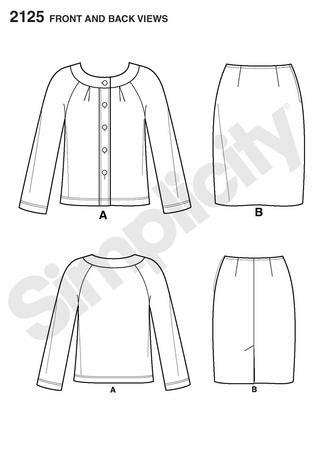 Wrong side of garment used interfacing at the sleeve hemline, iron fold and hand stitched. Would you sew it again: Mostly like yes, but for now will move on to another project. Concluion: Wore the cardigan yesterday and paired it with brown slacks & turtleneck. It wore well and perfect for a causal friday. 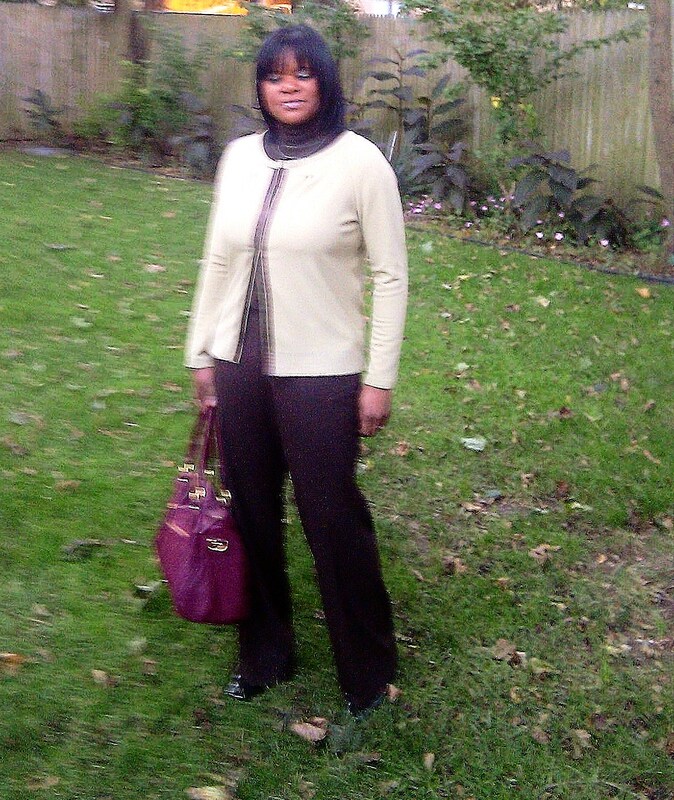 Of course rushing to take pictures before work yield blurry pics. 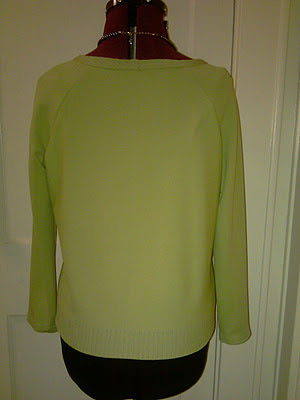 Did this fit the look of my rtw cardigans, no, but liked the relaxed fit of it.... on to the next project. I like this. It's a good look on you. Cardigans are my favorite. I tend to run warm, so I need something I can take on and off. I almost never wear a pullover because it is such a hassle for me temperature-wise. This is a cute cardigan and I have it in another Simplicity pattern. I'm sure if you make it again you will get the hang of the neckband but I love how you finished the hemline! looks fantastic! I can't believe how much comes out of your sewing room. You are prolific! Sheila I know you explained it but guess I'm just thick sometimes. 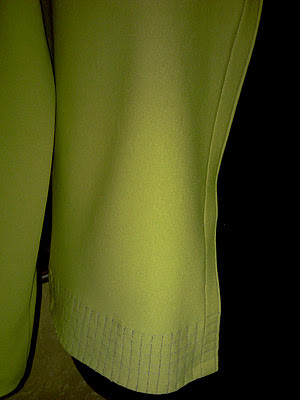 Is that topstitching on the hemline to simulate ribbing? Nothing like a cardigan to hide the hanging flags underneath my arms. The baby shower gift is precious. I'm assuming it's a boy. Problems aside - this is a very lovely cardigan. Love that stitching at the hemline. BTW - your thank-you card is gorgeous - such a wonderful surprise! Carolyn, I also purchased the other simplicity cardigan and looking forward to sewing it. Faye, yes it is topstitching. 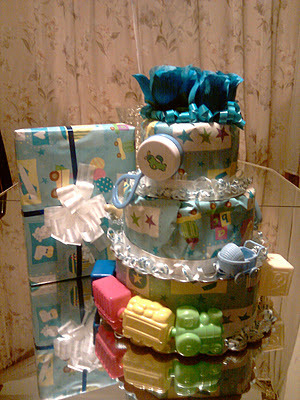 C-ing, yes, the young lady is expecting a boy, the baby shower was yesterday and the diaper cake was a hit. Irene, glad you like the card. I am trying to find the perfect pattern for the beautiful fabric you sent me. That turned out beautifully. I love cardis, and would love to have a whole closet full of them. I love cardigans, too. For now, I'll have to knit mine, which takes so much longer than sewing, lol! I love yours. What a cute "cake" and a cute cardi! I love the cardigan on you - very nice Ms. S. The diaper cake is quite cuite. Looking good, Sheila. Lovely cake. Looks good on you! Very snazzy! RE: Dress Palooza - join right in! Wow! I love cardigans too. I wish I could make such a fabulous one too. Your cardi looks great! You styled it beautifully, as usual. Love your baby shower gift. I'm sure the recipient did too! Work ready. Love it! I never noticed this pattern. It's on the list now.